In 2006, we said that Greenspan's reckless policies and pronouncements would drive people to such dire circumstances that there would be suicides. Pierce told us her husband was a partner with David Jones in an home owner investment group. They would buy houses and rent them. But then the market tanked and the investments failed. "Basically, any rent money goes right back into the mortgage, but it was never enough to cover the mortgage," she said. That $1,200 a month rent only covered half the mortgage. Carolyn and her husband were hemorrhaging money with one house already defaulted and their mansion about to go into foreclosure as well. Carolyn's says their financial situation was so bad her husband committed suicide. 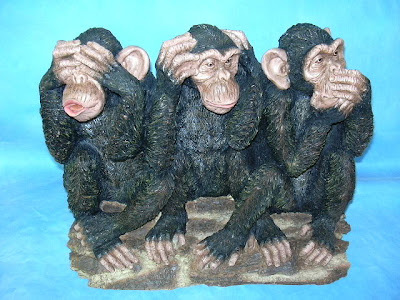 I recognize Bush and Bernanke as two of the monkeys, but who is the third? Mozilo? Schumer? Paulson? Who could have foreseen this? We did, that's who! You mofo's are going to be paying cash for foreclosed houses with your precious metals profits. Well done! In a time of tedious, pretentious, and pointless movies like No Country for Old Men and (so I hear) There will be Blood, In Bruges is a pleasant surprise. It's a dark comedy that had me laughing out loud throughout the movie. The premise is two Irish hit men who don't know why their boss has sent them to quaint little Bruges, Belgium. Hilarity ensues as they meet the tourists and locals. A brief cartoon sequence explains it all. Get your entries in now for this week's Best Caption Contest: Video Edition. This line from the original 1978 Superman film comes to mind as I read about the attempted bailout of the bond insurers by the banks. The insurers need a huge amount of capital to preserve their fictitious AAA ratings in the face of massive losses on bad mortgage securities that they've guaranteed. The banks also need to preserve those AAA ratings because the banks have huge exposure to the bad mortgage securities, and as long as there is "AAA" insurance on them, the banks can pretend there are no losses. Ponying up a few billion to prop up the imploding bond insurers for a while is less costly, in the short run, than confessing to huge losses on the banks' balance sheets. What we have in reality is two Lois Lanes, plummeting through the air against the Metropolis skyline, holding each other and assuring themselves and the world that they are not falling. That's the only possible explanation for him trying to split the Democratic vote again. AP is reporting that he's planning an announcement about his 2008 run for the presidency on "Meet the Press" tomorrow. Stay tuned. I liked him a lot better when he was a "consumer advocate." You'd think that with downer cattle in the food supply, toxic toys/pet food/toothpaste/tires/everything coming from China, and environmental protections under attack, he could find something to keep himself busy. Hillary has the gall to ask Obama supporters to "name one accomplishment." Let's turn that around. Hillary supporters, can you name one accomplishment? Eight years as First Lady and what, one horribly botched attempt to nationalize health care? Seven years in the Senate and not a single notable piece of legislation? What idiot on her train wreck of a campaign staff told her that accomplishments were a good issue to raise? Finally! A picture of Hillary that I can stand to look at. And then come back with a few of your own. McCain to Bush: You can still do that thing you do for me; I just don't want to be seen with you in public. Republican presidential candidate John McCain said Federal Reserve Chairman Ben S. Bernanke should have been quicker to cut interest rates to try to avert a recession. "I personally would have liked to have seen those rate cuts earlier,'' McCain said today on ABC's "This Week with George Stephanopoulos.'' "That doesn't mean I want him fired, it doesn't mean I've lost confidence,'' McCain said. I guess McCain thinks we should just have 0% interest forever, and we'll be fine. McCain to Obama: "Pretty please, don't use your energized base and broad popular appeal to raise funds. That wouldn't be fair!" Goes to show why McCain supports free speech bans and "campaign finance" restrictions. That's the only way a candidate despised by his base can compete. Here's the house I'm buying, as charted on Zillow. I think you'll agree, after studying the chart closely, this is a pretty shrewd move. Budgetary constraints? They can drop millions of $600 checks from helicopters, but they can't maintain one basic web site that simply displays government statistics? Kind of like the M3, huh? "Oh, it's too expensive to calculate. We don't have the resources. We're just the federal government. We'll have to leave it to someone with really deep pockets, some guy who runs a web site called ShadowStats." McCain '08 --Less Jobs, More Wars! Got any other ideas? If I get inspired, I'll probably order 100 or so and put them up around town. First there was the Super SIV. Then there was Helicopter Ben on steroids, dropping real interest rates to zero. Then there was tax forgiveness for short sales. Then there was the subprime ARM rate freeze. Then there was encouraging rating agencies to lie about the financial health of bond insurers. Then there was the $600 tax rebate that saved the economy. If you have a keen eye for detail, you may have noticed that none of these solved the housing mess. The new project involves a promise by top lenders to proactively contact homeowners who are 90 days or more late on their mortgage payments. Those borrowers would be sent a letter giving them a step-by-step approach that "may enable them to "pause" their foreclosure for 30 days while potential loan modification is evaluated," according to plan overview documents. Obama put out a video with the slogan Yes We Can which is very effective, meaningless propaganda. At least it's very entertaining. "Less jobs, more wars" McCain vs. "Embrace Iran, invade Pakistan" Obama. I've never seen him, but Zeke tells me that PBS interviewer Charlie Rose is great: "He's like Larry King with a brain." So last week, facing a McCain - Clinton race, I registered the domain name www.hillaryisanevilbitchbutimvotingforheranyway.com. Now, with Barack Obama adding Maine to his Washington, Nebraska, and Lousiana victories, he's starting to show some serious momentum. Maybe I won't have to activate that web site after all. It's kind of like blowing money on term life insurance. You're not really mad that it doesn't pay off. Americans are idiots, example #447128: AP poll: Leaving Iraq will help economy. The way to get the country out of recession — and most people think we're in one — is to get the country out of Iraq, according to an Associated Press-Ipsos poll. Pulling out of the war ranked first among proposed remedies in the survey, followed by spending more on domestic programs, cutting taxes and, at the bottom end, giving rebates to poor people in hopes they'll spend the economy into recovery. Say what you will about war, but one thing it's not is recessionary. Soldiers are employed and defense contractors fire up the factories, consistently causing an economic stimulus. End the war now and you'll send serving reservists back to compete with former realtors, mortgage brokers, and construction workers for a shrinking pool of job opportunities. Defense contractors' revenues will shrink, causing them to cut back on employment and purchases from their suppliers. And you thought your place was cool. Look at these lovely new San Francisco dwellings, with all the amenities of living in a railroad yard. True, you don't get a lot of sunset views through the windowless brown wall, but it does help a bit in cutting down the noise of the trains passing by. At first I thought these were some brilliant new condos, and I was ready to put down a deposit. Alas, they are only for rent, and only to low-income folks. However, you can buy a 495 sq. ft. studio with no external exposure (kind of like living in a self-storage unit) just across the street "starting in the low $400s." $850/sqft plus HOA fees! Sign me up! I was registered Republican just long enough to cast my vote for Ron Paul. That's enough for me. If this is a McCain - Huckabee Republican Party, I want nothing to do with it. I'm re-registering as an independent tomorrow, and I'll vote for Hillary or Obama over either one of those guys. On the plus side, the electoral massacre that's going to happen in November will probably cause the Republican Party to repent and turn to young, energetic, principled reformers. Pence? Flake? Coburn? DeMint? Sessions? 2012 calls. Where are you, Ben Bernanke? You have no idea how bad it is out there! NO IDEA!!! If you're a Ron Paul supporter, get out and vote! If you're a Hillary or McCain supporter, your primary is Wednesday. One update -- I said earlier that California was lost to McCain. Now it's too close to call between McCain and Romney. As part of the [stimulus] bill, Congress is set to rush through an increase in the mortgage loan limits for Fannie Mae and Freddie Mac (and Federal Housing Administration insurance, too) - from $417,000 to $729,750 - the first step toward a massive financial disaster in which taxpayers will end up paying through the nose. Something is happening here but you don't know what it is... or do you, Mr. Jones? The usually clueless mainstream media is waking up to the fact that the government is about to start guaranteeing jumbo mortgages for fraudsters, bailing out Wall Street and setting itself up for a bailout that will make the S&L crisis look like a picnic. When you strip away all of the white noise around a housing bubble, what you find is a robust market for housing that is undergoing several profound changes all of which manifest themselves in higher home price indexes, none of which adds up to a housing price bubble. If that's the wisdom of their chief economist, what does that say about the mental capacity of the line-level flunkie you're paying for advice? ...then you'll love this. The Wall Street Journal reported earlier this week about an item in Bush's forthcoming budget proposal: "an estimated $6 billion to build a secretive system protecting U.S. communication networks from attacks by terrorists, spies and hackers."